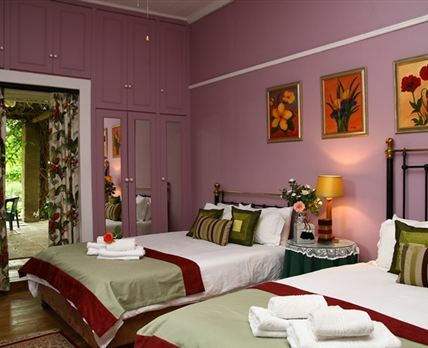 Villa Reinet Guest House is a national monument situated in the historic Karoo country town of Graaff-Reinet. This is the ideal place from which to explore this exciting part of South Africa. The villa rooms are in the beautiful historical monument building of our guest house, with larger proportions, high ceilings and fireplaces. The Garden Units are around the old pear tree in the large garden courtyard. Your hosts will gladly share knowledge of local interesting sites and activities, as you plan your day over scrumptious breakfasts which are served in the guinea fowl dining room. After a day exploring the delights of this fascinating area, socialize or relax in the Spandau Lounge, next to a log fire in winter, or get together with other guests around the fun splash pool in summer. Whatever your preference, come and enjoy our friendly hospitality, and share our beautiful historic monument and tranquil garden. Click here to enquire at Villa Reinet Guest House.